Highlights: The ninth meeting of the Conference of the Parties to the Rotterdam Convention (RC COP-9) will be held back to back with the fourteenth meeting of the Conference of the Parties to the Basel Convention (BC COP-14) and the ninth meeting of the Conference of the Parties to the Stockholm Convention (SC COP-9) from 29 April to 10 May 2019, in Geneva. The theme of the meetings will be " Clean Planet, Healthy People: Sound Management of Chemicals and Waste". The meetings will include joint sessions covering matters of relevance to at least two conventions and separate sessions of the meetings of the each of the three COPs. The meetings will not feature a high-level segment. Documents uploaded within the last five days have been highlighted in pale orange in the lists below. 2. Adoption of the agenda. 1. The ninth meeting of the Conference of the Parties to the Rotterdam Convention on the Prior Informed Consent Procedure for Certain Hazardous Chemicals and Pesticides in International Trade will be held at the Geneva International Conference Centre, 17 rue de Varembé, Geneva, from 29 April to 10 May 2019, back-to-back with the fourteenth meeting of the Conference of the Parties to the Basel Convention on the Control of Transboundary Movements of Hazardous Wastes and Their Disposal and the ninth meeting of the Conference of the Parties to the Stockholm Convention on Persistent Organic Pollutants. The meetings will feature joint sessions on joint issues. The meetings will be opened at 10 a.m. on Monday, 29 April 2019, by the three presidents of the conferences of the Parties. 1. At its ninth meeting, the Conference of the Parties to the Rotterdam Convention on the Prior Informed Consent Procedure for Certain Hazardous Chemicals and Pesticides in International Trade is expected to elect the officers of the Conference of the Parties who will serve during its tenth meeting. The present note provides information regarding these elections. 1. At its first meeting, by decision RC-1/1, the Conference of the Parties to the Rotterdam Convention on the Prior Informed Consent Procedure for Certain Hazardous Chemicals and Pesticides in International Trade adopted its rules of procedure, as contained in the annex to that decision, with the exception of the second sentence of paragraph 1 of rule 45, which it agreed to maintain in square brackets to indicate that it had not been agreed and was of no effect. 1. The Chemical Review Committee held its thirteenth and fourteenth meetings in Rome from 23 to 26 October 2017 and from 11 to 13 September 2018, respectively. The reports of those meetings are available in documents UNEP/FAO/RC/CRC.13/19 and UNEP/FAO/RC/CRC.14/10, respectively. 1. Pursuant to Article 5 of the Rotterdam Convention on the Prior Informed Consent Procedure for Certain Hazardous Chemicals and Pesticides in International Trade, the Chemical Review Committee at its thirteenth meeting reviewed notifications of final regulatory action for acetochlor in the pesticide category from the European Union and 10 African Parties, namely Burkina Faso, Cabo Verde, Chad, the Gambia, Guinea-Bissau, Mali, Mauritania, the Niger, Senegal and Togo, along with the supporting documentation referenced therein. As is mentioned in document UNEP/FAO/RC/COP.9/6, the Chemical Review Committee at its fourteenth meeting, in its decision CRC-14/1, adopted a draft decision guidance document on acetochlor. The draft decision guidance document is set out in the annex to the present note for the consideration of the Conference of the Parties. It has not been formally edited. 1. Pursuant to Article 5 of the Rotterdam Convention on the Prior Informed Consent Procedure for Certain Hazardous Chemicals and Pesticides in International Trade, the Chemical Review Committee at its thirteenth meeting reviewed notifications of final regulatory action for hexabromocyclododecane under the industrial chemicals category, submitted by Japan and Norway, together with the supporting documentation referred to therein. Taking into account each of the specific criteria set out in Annex II to the Convention, the Committee concluded that the criteria of the Annex had been met. Accordingly, the Committee agreed by its decision CRC-13/2 to recommend to the Conference of the Parties that hexabromocyclododecane be listed in Annex III to the Convention as an industrial chemical and proceeded to prepare a draft decision guidance document. As is mentioned in document UNEP/FAO/RC/COP.9/7, at its fourteenth meeting, in its decision CRC-14/2, the Chemical Review Committee adopted a draft decision guidance document on hexabromocyclododecane. The draft decision guidance document is set out in the annex to the present note for the consideration of the Conference of the Parties. It has not been formally edited. 1. Pursuant to Article 5 of the Rotterdam Convention on the Prior Informed Consent Procedure for Certain Hazardous Chemicals and Pesticides in International Trade, the Chemical Review Committee at its fifth and thirteenth meetings reviewed notifications of final regulatory action for phorate in the pesticide category from Canada and Brazil, respectively, along with the supporting documentation referred to therein. Taking into account each of the specific criteria set out in Annex II to the Convention, the Committee concluded that the notifications met the criteria of that Annex. Accordingly, the Committee agreed, by its decision CRC-13/4, to recommend to the Conference of the Parties that phorate be listed in Annex III to the Convention as a pesticide and proceeded to prepare a draft decision guidance document. As is mentioned in document UNEP/FAO/RC/COP.9/8, the Chemical Review Committee at its fourteenth meeting, in its decision CRC-14/3, adopted a draft decision guidance document on phorate. The draft decision guidance document is set out in the annex to the present note for the consideration of the Conference of the Parties. It has not been formally edited. 1. Pursuant to Article 5 of the Rotterdam Convention on the Prior Informed Consent Procedure for Certain Hazardous Chemicals and Pesticides in International Trade, the Chemical Review Committee at its eleventh meeting, in its decision CRC-11/4, recommended that carbosulfan be listed in Annex III to the Convention. Subsequently, at its twelfth meeting, by its decision CRC-12/2, the Committee, in accordance with Article 7 of the Rotterdam Convention, adopted a draft decision guidance document for carbosulfan (UNEP/FAO/RC/CRC.12/3/Rev.1) and decided to forward it, together with the related tabular summary of comments (UNEP/FAO/RC/CRC.12/INF/7/Rev.1), to the Conference of the Parties for its consideration. The draft decision guidance document is set out in the addendum to the present note (UNEP/FAO/RC/COP.9/9/Add.1) for the consideration of the Conference of the Parties. As is mentioned in document UNEP/FAO/RC/COP.9/9, the Chemical Review Committee at its twelfth meeting, in its decision CRC-12/2, adopted a draft decision guidance document on carbosulfan. The draft decision guidance document is set out in the annex to the present note for the consideration of the Conference of the Parties. It has not been formally edited. 1. Pursuant to Article 5 of the Rotterdam Convention on the Prior Informed Consent Procedure for Certain Hazardous Chemicals and Pesticides in International Trade, the Chemical Review Committee at its first meeting recommended that chrysotile asbestos be listed in Annex III to the Convention (UNEP/FAO/RC/CRC.1/28, annex I, section B). Subsequently, at its second meeting, the Committee, in accordance with Article 7 of the Convention, agreed on the text of a draft decision guidance document for the chemical (UNEP/FAO/RC/CRC.2/20, para. 106 and annex I) and decided to forward it to the Conference of the Parties for its consideration. The draft decision guidance document is set out in the addendum to the present note (UNEP/FAO/RC/COP.9/10/Add.1) for the consideration of the Conference of the Parties. As is mentioned in document UNEP/FAO/RC/COP.9/10, the Chemical Review Committee at its second meeting agreed on the text of a draft decision guidance document on chrysotile asbestos. The draft decision guidance document is set out in the annex to the present note for the consideration of the Conference of the Parties. It has not been formally edited. 1. Pursuant to Article 6 of the Rotterdam Convention on the Prior Informed Consent Procedure for Certain Hazardous Chemicals and Pesticides in International Trade, the Chemical Review Committee at its ninth meeting, in its decision CRC-9/4, recommended the listing of fenthion (ultra-low-volume (ULV) formulations at or above 640 g active ingredient/L) as a severely hazardous pesticide formulation in Annex III to the Convention. Subsequently, at its tenth meeting, in its decision CRC-10/2, the Committee, in accordance with Article 7 of the Rotterdam Convention, adopted a draft decision guidance document for fenthion (ULV formulations at or above 640 g active ingredient/L) (UNEP/FAO/RC/CRC.10/10/Add.2) and decided to forward it, together with the related tabular summary of comments (UNEP/FAO/RC/CRC.10/INF/5), to the Conference of the Parties for its consideration. The draft decision guidance document is set out in the addendum to the present note (UNEP/FAO/RC/COP.9/11/Add.1) for the consideration of the Conference of the Parties. As is mentioned in document UNEP/FAO/RC/COP.9/11, the Chemical Review Committee at its tenth meeting, in its decision CRC-10/2, adopted a draft decision guidance document on fenthion (ultra-low-volume (ULV) formulations at or above 640 g active ingredient/L). The draft decision guidance document is set out in the annex to the present note for the consideration of the Conference of the Parties. It has not been formally edited. 1. Pursuant to Articles 6 and 7 of the Rotterdam Convention on the Prior Informed Consent Procedure for Certain Hazardous Chemicals and Pesticides in International Trade, the Chemical Review Committee at its eighth meeting, in its decision CRC-8/7, recommended the listing of liquid formulations (emulsifiable concentrate and soluble concentrate) containing paraquat dichloride at or above 276 g/L, corresponding to paraquat ion at or above 200 g/L, as severely hazardous pesticide formulations in Annex III to the Convention; adopted a draft decision guidance document for those formulations (UNEP/FAO/RC/CRC.8/9/Rev.1); and decided to forward it, together with the related tabular summary of comments (UNEP/FAO/RC/CRC.8/INF/10/Rev.1), to the Conference of the Parties for its consideration. The draft decision guidance document is set out in the addendum to the present note (UNEP/FAO/RC/COP.9/12/Add.1) for the consideration of the Conference of the Parties. As is mentioned in document UNEP/FAO/RC/COP.9/12, the Chemical Review Committee at its eighth meeting, in its decision CRC-8/7, adopted a draft decision guidance document on liquid formulations (emulsifiable concentrate and soluble concentrate) containing paraquat dichloride at or above 276 g/L, corresponding to paraquat ion at or above 200 g/L. The draft decision guidance document is set out in the annex to the present note for the consideration of the Conference of the Parties. It has not been formally edited. 1. As is mentioned in document UNEP/FAO/RC/COP.9/13, annex I to the present note sets out proposals to amend two provisions of the Rotterdam Convention on the Prior Informed Consent Procedure for Certain Hazardous Chemicals and Pesticides in International Trade, submitted by a number of African countries in October 2016 for consideration by the Conference of the Parties at its eighth meeting (UNEP/FAO/RC/COP.8/16/Add.1): Article 16 on technical assistance and Article 22 on adoption and amendment of annexes. The proposals were submitted by Botswana, Cameroon, Ghana, Kenya, Lesotho, Malawi, Mozambique, Namibia, Nigeria, South Africa, Swaziland, the United Republic of Tanzania, Zambia and Zimbabwe in the case of Article 16, and by Botswana, Cameroon, Ghana, Kenya, Lesotho, Malawi, Mozambique, Namibia, Nigeria, Swaziland, the United Republic of Tanzania and Zambia in the case of Article 22. 1. Article 17 of the Rotterdam Convention on the Prior Informed Consent Procedure for Certain Hazardous Chemicals and Pesticides in International Trade provides for the development and approval of procedures and institutional mechanisms for determining non-compliance with the provisions of the Convention and for the treatment of Parties found to be in non compliance. 1. As is mentioned in the note by the Secretariat on the procedures and mechanisms on compliance with the Rotterdam Convention on the Prior Informed Consent Procedure for Certain Hazardous Chemicals and Pesticides in International Trade (UNEP/FAO/RC/COP.9/14), on 22 October 2018 the Secretariat received a proposal by Canada, Colombia, Costa Rica, Ghana, Jordan, Mali, Nigeria, Peru, Switzerland, Thailand, the United Republic of Tanzania and Zambia for a new Annex VII to the Convention entitled “Procedures and mechanisms on compliance with the Rotterdam Convention”. 1. In decisions BC-13/19, RC-8/12 and SC-8/22, on the clearing house mechanism for information exchange, the conferences of the Parties to the Basel Convention on the Control of Transboundary Movements of Hazardous Wastes and Their Disposal, the Rotterdam Convention on the Prior Informed Consent Procedure for Certain Hazardous Chemicals and Pesticides in International Trade and the Stockholm Convention on Persistent Organic Pollutants, respectively, requested the Secretariat, subject to the availability of resources, to start the work to implement the strategy of the joint clearing house mechanism (UNEP/CHW.13/INF/47-UNEP/FAO/RC/COP.8/INF/33-UNEP/POPS/COP.8/INF/50), and to implement the activities of the workplan for the biennium 2018–2019 (UNEP/CHW.13/INF/48-UNEP/FAO/RC/COP.8/INF/39-UNEP/POPS/COP.8/INF/43) in accordance with the programmes of work and budgets for the conventions for the biennium. 1. In decisions BC-13/20, RC-8/13 and SC-8/23, on mainstreaming gender, of the Basel Convention on the Control of Transboundary Movements of Hazardous Wastes and Their Disposal, the Rotterdam Convention on the Prior Informed Consent Procedure for Certain Hazardous Chemicals and Pesticides in International Trade and the Stockholm Convention on Persistent Organic Pollutants, respectively, the conferences of the Parties to the three conventions welcomed the Gender Action Plan of the Secretariat of the Basel, Rotterdam and Stockholm Conventions and the report on the implementation of the Plan (UNEP/CHW.13/INF/46–UNEP/FAO/RC/COP.8/INF/32–UNEP/POPS/COP.8/INF/49, annex) and requested the Secretariat to continue its efforts in respect of gender mainstreaming in its activities, projects and programmes. 1. In decisions BC-13/21, RC-8/14 and SC-8/24, on synergies in preventing and combating illegal traffic and trade in hazardous chemicals and wastes, the conferences of the Parties to the Basel Convention on the Control of Transboundary Movements of Hazardous Wastes and Their Disposal, the Rotterdam Convention on the Prior Informed Consent Procedure for Certain Hazardous Chemicals and Pesticides in International Trade and the Stockholm Convention on Persistent Organic Pollutants, among other things, invited Parties to share their experience with the establishment of coordinating mechanisms at the national level and lessons learned; and information on cases of illegal trade in hazardous chemicals and wastes. 1. At their meetings in 2017, the conferences of the Parties to the Basel Convention on the Control of Transboundary Movements of Hazardous Wastes and Their Disposal, the Rotterdam Convention on the Prior Informed Consent Procedure for Certain Hazardous Chemicals and Pesticides in International Trade and the Stockholm Convention on Persistent Organic Pollutants adopted identical decisions (decisions BC-13/22, RC-8/15, SC-8/25), entitled “From science to action”, by which, among other things, they took note of a draft road map, prepared by the Secretariat, for further engaging Parties and other stakeholders in an informed dialogue for enhanced science-based action in the implementation of the conventions (UNEP/CHW.13/INF/50–UNEP/FAO/RC/COP.8/INF/35–UNEP/POPS/COP.8/INF/52). 1. The present scenario note sets out a proposal for arrangements for the conduct of, and thereby aims to assist participants in preparing for, the fourteenth meeting of the Conference of the Parties to the Basel Convention on the Control of Transboundary Movements of Hazardous Wastes and Their Disposal, the ninth meeting of the Conference of the Parties to the Rotterdam Convention on the Prior Informed Consent Procedure for Certain Hazardous Chemicals and Pesticides in International Trade and the ninth meeting of the Conference of the Parties to the Stockholm Convention on Persistent Organic Pollutants. The annexes to the present note contain a tentative schedule of work of the meetings of the conferences of the Parties to the Basel, Rotterdam and Stockholm conventions (annex I) and a list of possible contact and other groups (annex II). The tentative schedule of work, which was agreed to by the bureaux of the conferences of the Parties to the three conventions at their joint meeting on 15 and 16 November 2018, is provisional and could be subject to changes before or during the two weeks of the meetings. The present note, including its annexes, has not been formally edited. As is mentioned in the notes by the Secretariat on election of officers (UNEP/CHW.14/2, UNEP/FAO/RC/COP.9/2 and UNEP/POPS/COP.9/2), an overview table of all the elections expected to take place during the fourteenth meeting of the Conference of the Parties to the Basel Convention on the Control of Transboundary Movements of Hazardous Wastes and Their Disposal, the ninth meeting of the Conference of the Parties to the Rotterdam Convention on the Prior Informed Consent Procedure for Certain Hazardous Chemicals and Pesticides in International Trade and the ninth meeting of the Conference of the Parties to the Stockholm Convention on Persistent Organic Pollutants is set out in the annex to the present note. The present note, including its annex, has not been formally edited. As is mentioned in the note by the Secretariat on election of officers (UNEP/FAO/RC/COP.9/2), the annex to the present note sets out the curricula vitae received in advance of the ninth meeting of the Conference of the Parties to the Rotterdam Convention of candidates nominated for appointment as members of the Chemicals Review Committee with terms of office from 1 May 2020 to 30 April 2024. The present note, including its annex, has not been formally edited. 1. In order to facilitate consideration of the credentials of the representatives of the Parties present at the fourteenth meeting of the Conference of the Parties to the Basel Convention, the ninth meeting of the Conference of the Parties to the Rotterdam Convention, and the ninth meeting of the Conference of the Parties to the Stockholm Convention, the Secretariat has prepared a table listing those States and political or regional economic integration organizations that have deposited with the depositary their relevant instruments expressing their consent to be bound by these conventions, as at 17 January 2019. This table is attached as an annex to the present note. As is mentioned in section II.C on exchanging information on exports and export notifications of the note by the Secretariat on the status of implementation of the Convention (UNEP/FAO/RC/COP.9/4), the Secretariat carried out a survey, from 12 October to 31 December 2017, on the implementation of paragraph 2 of Article 11 and Articles 12 and 14 of the Rotterdam Convention to obtain information from Parties pertaining to the calendar year 2016 (from 1 January 2016 to 31 December 2016). The annex to the present note sets out the responses received from Parties to the questionnaire. The present note, including its annex, has not been formally edited. As is mentioned in the note by the Secretariat on Chemical Review Committee: developments for action by the Conference of the Parties (UNEP/FAO/RC/COP.9/5), the annex to the present note sets out a compilation of comments received from Parties relating to the listing of chemicals and severely hazardous pesticide formulations in Annex III to the Rotterdam Convention recommended by the Chemical Review Committee. The comments were submitted by Albania, the European Union, Kazakhstan, Kenya, Mali, Mexico, Oman, Pakistan, Russian Federation and Serbia. The present note, including its annex, has not been formally edited. To facilitate consideration by the Conference of the Parties of the inclusion of acetochlor in Annex III to the Rotterdam Convention, the annexes to the present note set out respectively decision CRC-13/1 on the recommendation by the Chemical Review Committee pertaining to the substance including the rationale prepared by the Committee at its thirteenth meeting and decision CRC-14/1 adopting the draft decision guidance document on acetochlor and forwarding it to the Conference of the Parties. The present note has not been formally edited. 1. At its fourteenth meeting, the Chemical Review Committee finalized the text of the draft decision guidance document for acetochlor, as set out in the annex to document UNEP/FAO/RC/COP.9/6/Add.1, and agreed to forward it, together with the related tabular summary of comments received and how they were taken into account in the preparation of the draft decision guidance document, to the Conference of the Parties for its consideration. To facilitate consideration by the Conference of the Parties of the inclusion of hexabromocyclododecane in Annex III to the Rotterdam Convention, the annexes to the present note set out respectively decision CRC-13/2 on the recommendation by the Chemical Review Committee pertaining to the substance including the rationale prepared by the Committee at its thirteenth meeting and decision CRC-14/2 adopting the draft decision guidance document on hexabromocyclododecane and forwarding it to the Conference of the Parties. The present note has not been formally edited. 1. At its fourteenth meeting, the Chemical Review Committee finalized the text of the draft decision guidance document for hexabromocyclododecane, as set out in the annex to document UNEP/FAO/RC/COP.9/7/Add.1, and agreed to forward it, together with the related tabular summary of comments received and how they were taken into account in the preparation of the draft decision guidance document, to the Conference of the Parties for its consideration. To facilitate consideration by the Conference of the Parties of the inclusion of phorate in Annex III to the Rotterdam Convention, the annexes to the present note set out respectively decision CRC 13/4 on the recommendation by the Chemical Review Committee pertaining to the substance including the rationale prepared by the Committee at its thirteenth meeting, the rationale prepared by the Committee at its fifth meeting and decision CRC-14/3 adopting the draft decision guidance document on phorate and forwarding it to the Conference of the Parties. The present note has not been formally edited. 1. At its fourteenth meeting, the Chemical Review Committee finalized the text of the draft decision guidance document for phorate, as set out in the annex to document UNEP/FAO/RC/COP.9/8/Add.1, and agreed to forward it, together with the related tabular summary of comments received and how they were taken into account in the preparation of the draft decision guidance document, to the Conference of the Parties for its consideration. 1. In decisions BC-13/24, RC-8/17 and SC-8/27 on programmes of work and budgets for the biennium 2018–2019, the conferences of the Parties to the Basel Convention on the Control of Transboundary Movements of Hazardous Wastes and Their Disposal, the Rotterdam Convention on the Prior Informed Consent Procedure for Certain Hazardous Chemicals and Pesticides in International Trade and the Stockholm Convention on Persistent Organic Pollutants, among other things, invited the Executive Secretary to provide any secretariat support that may be requested and fully funded by the Conference of the Parties to the Minamata Convention. As is mentioned in the note by the Secretariat on enhancing the effectiveness of the Rotterdam Convention (UNEP/FAO/RC/COP.9/13), the annex to the present note sets out an analysis of the operational implications of the proposals to amend the Convention, including those submitted to the eighth meeting of the Conference of the Parties, and the proposals for a voluntary prior informed consent procedure. The analysis builds on the preliminary information contained in the report on legal and operational implications of priority actions to enhance the effectiveness of the Rotterdam Convention (UNEP/FAO/RC/EFF.1/2), and takes into account the comments received to date and the discussions at the meeting of the intersessional working group on enhancing the effectiveness of the Rotterdam Convention held from 4 to 6 June 2018 in Riga, Latvia). The present note, including its annex, has not been formally edited. 1. As is mentioned in the note by the Secretariat on enhancing the effectiveness of the Rotterdam Convention (UNEP/FAO/RC/COP.9/13), at its meeting from 4 to 6 June 2018 in Riga, Latvia, the intersessional working group on enhancing the effectiveness of the Rotterdam Convention recommended that the Secretariat identify and propose, if appropriate, for consideration at the ninth meeting of the Conference of the Parties, recommendations for improving participation, openness, and transparency in the Chemical Review Committee process, with the aim of: increasing the engagement of the Committee, both its members and its observers; furthering the understanding of the criteria of the Convention and the necessary review required by Article 5; and facilitating the engagement of all Parties (recommendation 1.1.4). As is mentioned in paragraph 12 of note by the Secretariat on enhancing the effectives of the Rotterdam Convention (UNEP/FAO/RC/COP.9/13), the Secretariat has explored new and innovative ways of improving information exchange under the Rotterdam Convention and has developed a proposal for consideration by the Conference of the Parties, which is set out in the annex to present note. The present note, including its annex, has not been formally edited. 1. As is mentioned in the note by the Secretariat on enhancing the effectiveness of the Rotterdam Convention (UNEP/FAO/RC/COP.9/13), at its meeting from 4 to 6 June 2018 in Riga, Latvia, the intersessional working group on enhancing the effectiveness of the Rotterdam Convention recommended that the Secretariat identify ways to facilitate effective and useful dissemination of the information, tools and guidance and use in capacity-building and technical assistance activities. In addition, the Secretariat was requested to identify gaps, taking into account existing information and guidance, and provide assistance, upon request, subject to the availability of funding (recommendation 1.3.3). As is mentioned in the note by the Secretariat on enhancing the effectiveness of the Rotterdam Convention (UNEP/FAO/RC/COP.9/13), the annexes to the present note provide information pertaining to the assignment of customs codes to substances listed under the Rotterdam Convention on the Prior Informed Consent Procedure for Certain Hazardous Chemicals and Pesticides in International Trade and activities undertaken towards that end by the Secretariat as part of its cooperation with the World Customs Organization. The present note, including its annexes, has not been formally edited. 1. As is mentioned in the note by the Secretariat on enhancing the effectiveness of the Rotterdam Convention (UNEP/FAO/RC/COP.9/13), at its meeting from 4 to 6 June 2018 in Riga, Latvia, the intersessional working group on enhancing the effectiveness of the Rotterdam Convention recommended that the Secretariat compile information on effectiveness evaluation practices under other chemicals and wastes conventions, taking into account the specificities of the Rotterdam Convention, and prepare options for a framework on the assessment of the effectiveness of the Rotterdam Convention for consideration at the ninth meeting of the Conference of the Parties (recommendation 1.4.1). 1. As is mentioned in the note by the Secretariat on enhancing the effectiveness of the Rotterdam Convention (UNEP/FAO/RC/COP.9/13), at its meeting from 4 to 6 June 2018 in Riga, Latvia, the intersessional working group on enhancing the effectiveness of the Rotterdam Convention recommended that the Conference of the Parties at its ninth meeting invite increased cooperation with other forums engaged in chemicals management to collaborate in addressing issues that support implementation of the Convention (recommendation 2.3.4). As is mentioned in the note by the Secretariat on technical assistance and capacity-building for the implementation of the Basel, Rotterdam and Stockholm conventions (UNEP/CHW.14/16-UNEP/FAO/RC/COP.9/15-UNEP/POPS/COP.9/16), the annex to the present note contains the report on the implementation of the technical assistance plan for the period 2018–2021 in the biennium 2018–2019, including an overview of the Basel, Rotterdam and Stockholm Conventions’ global, regional and national capacity-building and training activities undertaken or planned by the Secretariat from 1 January 2018 to 31 December 2019, subject to the availability of financial resources. The present note, including its annex, has not been formally edited. 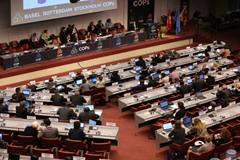 As is mentioned in the note by the Secretariat on the proposal to add a new Annex VII on procedures and mechanisms on compliance with the Rotterdam Convention (UNEP/FAO/RC/COP.9/14/Add.1), the annex to the present note sets out a compilation of the comments received from Parties relating to the proposed new Annex VII. The present note, including its annex, has not been formally edited. 1. As is mentioned in the note by the Secretariat on technical assistance and capacity-building for the implementation of the Basel, Rotterdam and Stockholm conventions (UNEP/CHW.14/16–UNEP/FAO/RC/COP.9/15–UNEP/POPS/COP.9/16), the annex to the present note sets out a monitoring and evaluation strategy for the technical assistance plan for the implementation of the Basel, Rotterdam and Stockholm conventions. The present note, including its annex, has not been formally edited. The annex to the present note sets out a report by the Secretariat on the implementation of the integrated approach to financing sound management of chemicals and wastes including its three mutually reinforcing components: mainstreaming, industry involvement and dedicated external finance. The present note, including its annex, has not been formally edited. 1. The annex to the present note sets out a report by the United Nations Environment Programme on activities of the Special Programme to support institutional strengthening at the national level for implementation of the Basel, Rotterdam and Stockholm conventions, the Minamata Convention on Mercury, and the Strategic Approach to International Chemicals Management. The present note, including its annex, has not been formally edited. As is mentioned in the note by the Secretariat on international cooperation and coordination (UNEP/CHW.14/20-UNEP/FAO/RC/COP.9/16-UNEP/POPS/COP.9/23), the annex to the present note sets out a report providing detailed information on the activities undertaken by the Secretariat on cooperation and coordination with intergovernmental organizations, international and regional organizations, other multilateral environmental agreement secretariats, and non-governmental organizations and networks from 1 January 2017 to 31 December 2018. The activities described in the report are either specific to one Convention or relevant to two or three conventions. The present note, including its annex, has not been formally edited. 1. As is mentioned in the note by the Secretariat on international cooperation and coordination (UNEP/CHW.14/20-UNEP/FAO/RC/COP.9/16-UNEP/POPS/COP.9/23), the annex to the present note sets out a report submitted by the Executive Director of the United Nations Environment Programme to the meetings of the conferences of the Parties to the Basel, Rotterdam and Stockholm conventions. The present note, including its annex, has not been formally edited. As is mentioned in the note by the Secretariat on international cooperation and coordination (UNEP/CHW.14/20-UNEP/FAO/RC/COP.9/16-UNEP/POPS/COP.9/23), the annex to the present note sets out a report providing updates on the Minamata Convention on Mercury, including activities relevant to the work of the Basel, Rotterdam and Stockholm conventions, submitted by the secretariat of the Minamata Convention. The present note, including its annex, has not been formally edited. As is mentioned in the note by the Secretariat on the clearing house mechanism for information exchange (UNEP/CHW.14/21-UNEP/FAO/RC/COP.9/17-UNEP/POPS/COP.9/24), the annex to the present note sets out the draft workplan for the implementation of the joint clearing house mechanism for the biennium 2020-2021. The present note, including its annex, has not been formally edited. As is mentioned in the note by the Secretariat on synergies in preventing and combating illegal traffic and trade in hazardous chemicals and wastes (UNEP/CHW.14/23-UNEP/FAO/RC/COP.9/19-UNEP/POPS/COP.9/26), the annex to the present note sets out a report prepared by the Secretariat on further areas, including areas common to two or three of the conventions, in which legal clarity could be improved. The present note, including its annex, has not been formally edited. As is mentioned in the note by the Secretariat on from science to action (UNEP/CHW.14/24–UNEP/FAO/RC/COP.9/20–UNEP/POPS/COP.9/27), the annex to the present note sets out a draft road map on from science to action prepared by the Secretariat. The present note, including its annex, has not been formally edited. 1. As is mentioned in the note by the Secretariat on programmes of work and proposed budgets for the biennium 2020–2021: combined proposal including joint activities (UNEP/CHW.14/25-UNEP/FAO/RC/COP.9/21-UNEP/POPS/COP.9/28), the annex to the present note sets out budget activity fact sheets for the Basel, Rotterdam and Stockholm conventions developed by the Secretariat. They should be read in conjunction with the aforementioned note and the information document on programmes of work and proposed budgets for the biennium 2020−2021: proposed operational budgets for the two funding scenarios (UNEP/CHW.14/INF/43-UNEP/FAO/RC/COP.9/INF/36-UNEP/POPS/COP.9/INF/45). 1. By its decision RC-5/1, the Conference of the Parties to the Rotterdam Convention on the Prior Informed Consent Procedure for Certain Hazardous Chemicals and Pesticides in International Trade adopted financial rules for the operation of the Conference of the Parties, its subsidiary bodies and the Secretariat. Paragraph 1 of rule 3, which deals with the budget, requires the executive secretaries to dispatch information on actual income and expenditure for each year of the previous biennium and estimates of actual expenditures in the current biennium, to all Parties to the Convention at least 90 days before the opening of the meeting of the Conference of the Parties at which the budget for a given biennium is to be adopted. 1. The annexes to the present note contain information on pledges and contributions to the technical cooperation and voluntary special trust funds of the Basel, Rotterdam and Stockholm conventions received in the biennium 20182019 as at 3 April 2019. Annex I contains an overview of such pledges and contributions received from Parties. Annex II contains information on such pledges and contributions for each programme of work activity in relation to the approved budgets for the biennium 2018-2019. Annex III contains more detailed information on pledges and contributions received by Party. All amounts are in United States dollars, unless otherwise stated, and include programme support costs. As is mentioned in the note by the Secretariat on programmes of work and budgets for the biennium 2020–2021: combined proposal including joint activities (UNEP/CHW.14/25–UNEP/FAO/RC/COP.9/21–UNEP/POPS/COP.9/28), the annex to the present note sets out a note from the Executive Director of the United Nations Environment Programme on cooperation between the secretariat of the Minamata Convention and the secretariat of the Basel, Rotterdam and Stockholm conventions. The annex is reproduced as received from the Executive Director. As is mentioned in the note by the Secretariat on procedures and mechanisms on compliance with the Rotterdam Convention: proposal to add a new Annex VII on procedures and mechanisms on compliance with the Rotterdam Convention (UNEP/FAO/RC/COP.9/14/Add.1), the annex to the present note sets out an explanatory note submitted by the Parties proposing to add a new Annex VII on procedures and mechanisms on compliance with the Rotterdam Convention, in the six official languages of the United Nations. The submission is reproduced as received. The present note, including its annex, has not been formally edited. As is mentioned in documents UNEP/CHW.14/26, UNEP/FAO/RC/COP.9/22 and UNEP/POPS/COP.9/29, the annex to the present note sets out the March 2018 United Nations Environment Programme flexible template of options for the provision of secretariat services. The present note, including its annex, has not been formally edited. As is mentioned in documents UNEP/CHW.14/26, UNEP/FAO/RC/COP.9/22 and UNEP/POPS/COP.9/29, the annex to the present note sets out the November 2016 United Nations Environment Programme delegation of authority policy and framework for the management and administration of multilateral environmental agreement secretariats. The present note, including its annex, has not been formally edited. As is mentioned in the note by the Secretariat on gender mainstreaming (UNEP/CHW.14/22–UNEP/FAO/RC/COP.9/18–UNEP/POPS/COP.9/25), the annex to the present note provides a report on gender-related activities implemented by the Secretariat, as outlined in the updated Gender Action Plan of the Secretariat of the Basel, Rotterdam and Stockholm conventions. The updated plan includes indicators for monitoring progress so as to enable the conferences of the Parties to follow up on the plan’s implementation. The present note, including its annex, has not been formally edited. 1. Meetings of the Conference of the Parties shall take place at the seat(s) of the Secretariat, unless other appropriate arrangements are made by the Secretariat in consultations with the Parties. In the case of the Basel Convention on the Control of Transboundary Movements of Hazardous Wastes and Their Disposal and the Stockholm Convention on Persistent Organic Pollutants, the seat of the Secretariat is at Geneva, Switzerland. In the case of the Rotterdam Convention on the Prior Informed Consent Procedure for Certain Hazardous Chemicals and Pesticides in International Trade, the seats of the Secretariat are at Geneva, Switzerland, and Rome, Italy. 1. As is mentioned in UNEP/CHW.14/INF/57–UNEP/FAO/RC/COP.9/INF/46–UNEP/POPS/COP.9/INF/60, Governments wishing to submit offers to host the 2021 meetings of the conferences of the Parties to the Basel, Rotterdam and Stockholm Conventions, were encouraged to submit such offers to the Secretariat by 29 March 2019. As is mentioned in the notes by the Secretariat on annotations to the provisional agendas (UNEP/CHW.14/1/Add.1, UNEP/FAO/RC/COP.9/1/Add.1 and UNEP/POPS/COP.9/1/Add.1), the annex to the present note sets out Guidelines on preventing and addressing all forms of harassment at meetings of the Basel, Rotterdam and Stockholm conventions. The present note, including its annexes, has not been formally edited. The annex to the present note sets out a provisional list of meeting documents for the ninth meeting of the Conference of the Parties to the Rotterdam Convention. The documents listed in the annex are grouped according to the items on the provisional agenda for the meeting to which they pertain. Documents that have three document symbols are joint documents that are submitted for consideration by the conferences of the Parties to the Basel, Rotterdam and Stockholm conventions. The present note, including its annex, has not been formally edited.